After completing the training course you will have access to the CCI network, and if you join a local CCI group you will receive contact details of other co-counsellors. You may, if you wish, attend workshops and residentials, where you can experience ways of working and playing together free from some of the restrictive interactions of the everyday world. The details of these events are put onto the CCI website Some of the information can only be accessed if you have the password. Gatherings are usually non-residential and are organised on a local basis. For example, in West Yorkshire they tend to happen in Leeds. Currently we have a series of Gatherings every month or two. What happens at a gathering? We have an opening cirlce, then see what everyone wants. Usually this will involve either a group activity or session, or else we pair up and have two-way sessions. Or we do both. These are either a week-end (including the Monday if it’s a Bank Holiday) or else a whole week. A small group (say 3-4 people) will book a venue and do the necessary publicity. The organising group will welcome people to the event, and host the initial opening circle which gets the event started. They will also devise a blank timetable structure, which usually has spaces for morning and afternoon workshops. Evening activities are generally more social, relaxation or fun based (singing, games, cabaret, dancing, bonfires, music, massage etc, or just chatting). Cost varies from event to event, but most are low to medium cost. Many offer cheaper prices if you camp. The blank workshop spaces are then filled, as the event progresses, by workshops that people either want or offer. These workshops are either peer-led or else facilitated by the person who offers. They are either strictly co-counselling based, or non-co-counselling, or else a mixture of the two. The person who suggested the workshop makes it clear what is on offer. You only participate in activities that you choose. The workshops often have a theme e.g. The list of possiblities is almost endless. These events have elements built into them that are aimed to help create a supportive environment. We usually form support groups (usually 4-7 people) early on at the event. They meet for an hour each day e.g. after tea-time. At the beginning of a residential attention is often given to helping everyone – not just ”new people” – settle in. This may be, for example, some group-building exercise, or a session-based workshop on ”being here”. At some events people may choose to have a ”buddy”. The point of all this is to help create an environment where it feels safe enough to take the risks involved in personal growth. Ultimately however, no situation is entirely free from risk or challenge. Also, if you need some support at a specific time, you may need to take the responsibility for asking for it. The following is a sample of what may be available. 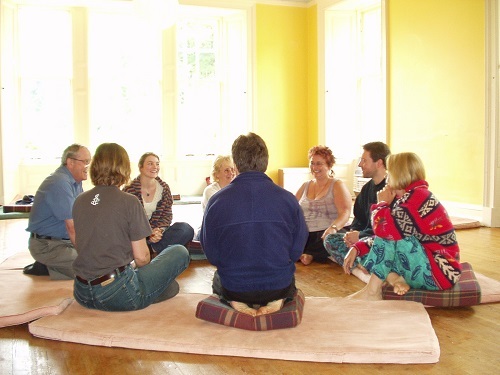 Co-Counselling at Laurieston Hall, Near Castle Douglas, Near Dumfries, SW Scotland. One week long, usually in August. Numbers: 63 (12 children maximum). This event has a truly liberating atmosphere. Children love it here too. The place is a kind of oasis away from ”normal life”, with wonderful home-grown food, shelter from traffic, a co-operative living environment and a truly wonderful natural setting – woods, gardens, loch, wood-burning sauna, pond, big old house. There are usually lots of workshops, and it may be possible to take a journey into and out of oneself. Go to this for the international atmosphere – people from the UK, Germany, Hungary, Holland, Ireland, USA and other places. It’s the biggest event 60 – 100 people. Lots of workshops usually on offer. The venue rotates each year: Scotland (1999), Republic of Ireland (2000), Hungary (2001), Netherlands (2002), England (2003), Germany (2004), Republic of Ireland (2005), Hungary (2006), Netherlands (2007), Scotland (2008), Germany (2009), Ireland (2010), Hungary (2011), Netherlands (2012), England (2013), Germany (2014) and Ireland (2015). An Grianan, Termonfeckin, Ireland, venue for the 2010 CCI gathering. In Scotland, usually in Spring. There are children’s places available. This is organised by the Scottish co-counsellors and attracts both Scottish and English participants. It’s run on the same lines as Unstone, and is usually at Wiston Lodge. This is a stunningly beautiful venue: the natural setting offers both the possibility of peace and seclusion from the outside world and an invigorating and stimulating environment for personal growth. The house has grounds, woodland walks and attached land amounting to 55 acres. The food at the Lodge is fresh and truly wonderful: the food at this event will be vegetarian. Sleeping accommodation is in shared rooms. You are also welcome to camp. This is the Spring event in northern England, in a big old house South of Chesterfield, over a long week-end. Numbers are 30 – 45. It’similar to Barmoor only with more workshops, less child-focussed, and more opportunities for challenge, if that is what you seek. Children are still welcome though, and childcare is shared by those who either wish to do it or have who brought kids with them. This is similar to Unstone too, with about 35 places. Early January, for four days. This is in Cornwall, at Bosweddon. This is the annual event in Spring organised by our American friends. Wisdom House, Near Hartford, Connecticut: one of the venues used for the annual CCI gathering in the USA. There is a CCI event in New Zealand too, usually January. Near Malton and Pickering, N. Yorks, usually July. The annual week-end residiential in North Yorkshire usually encompasses a Monday. Numbers are about 25, very child-friendly. There are usally about 5 or 6 children. People take turns to look after children (not compulsory if you are there as a non-parent). This workshop has a very relaxed feel, with quite alot of ”chilling out”. Workshops are generally, but not always, less challenging than at other events. The location is beautiful, looking out over the North Yorkshire moors, near Pickering. We share the cooking. Low-ish cost. Barmoor, Near Malton and Pickering, N. Yorks, usually September.